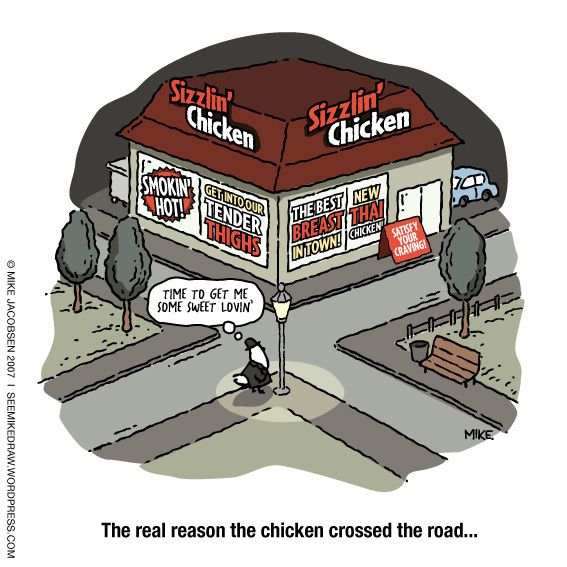 This cartoon is finger lickin’ good. | the rut. Ha that’s great, I love how the Dr has already crumbed and cooked it for him. Nice one! Please remove this cartoon within 24 hours or legal action will be taken. Nice try, KFC Ltd. I ain’t biting. 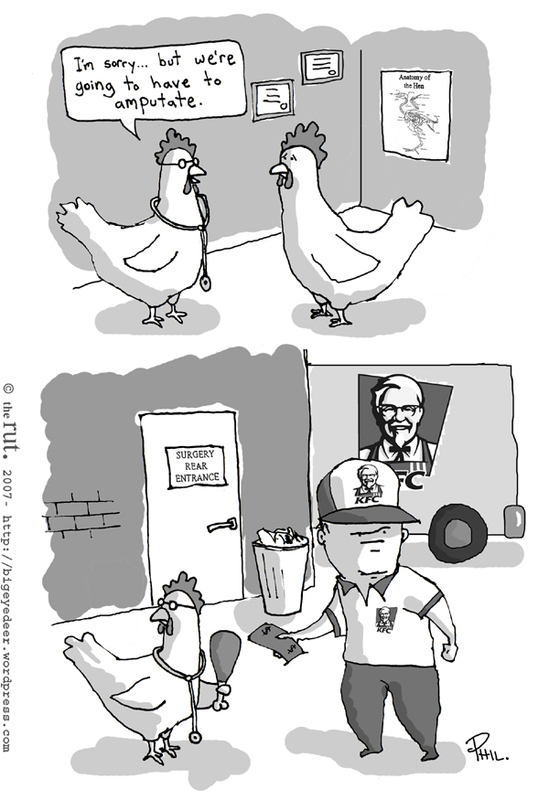 Maybe if the comment had come from “Colonel Sanders” I might have believed it. Thanks Lis. Now I need you to organise a counter-suit against KFC. For, um, I don’t know… well, I had some soggy chips the other day. Can I sue them for that? And I’m assuming that this cartoon was in no way inspired by some other random cartoon. Curses! My evil plan didn’t work! But admit it Phil, you were a little bit scared. Harish, it’s only natural that Phil should take inspiration from someone he looks up to and admires so much. I’m battered… um I mean flattered Phil. Should’ve known Barn Dog would be behind this scam… it’s got his muddy little paw prints all over it! Laughed heartily at this one!! Thanks a lot, Phil! Hehe good one Mikey, I was drawing up the doucments as I read the rest of the comments and was looking for what action could be taken by them. Nice gag, as usual!!! This just makes me wonder what the taco trucks are feeding us.